The SMTP-Listener-Task is used for receiving SMTP e-mails. 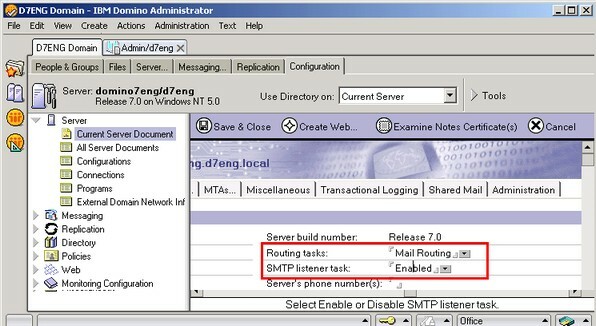 If you have a default installation, the SMTP-Listener-Task of the Domino 7 Server is enabled. However, the enabling of the SMTP-Listener-Task must be executed in the context with the installation of the ixi-UMS Business Domino Connector, anyway. If the SMTP listener task is not enabled so far, you will have to enable the task now. If the SMTP listener task is configured like shown below, the SMTP listner task is entered automatically in the "notes.ini" of the server. As a result, the SMTP listener task is started as well when you restart your IBM Domino Server.